The launching of the PS Connaught, flagship of the Galway Line, on April 21 1860 at Jarrow, on the Tyneside (both pictures from Tim Collins’ book). The loss of the PS Connaught, October 8 1860, launched to reverse the sliding fortunes of the J Orwell Lever’s Galway Line, was a severe blow to the company. Although the local press tried to make the most of the fact that of the 591 people on board, not one life was lost, the bad publicity soured the public towards the Galway Line, which was also in financial trouble. 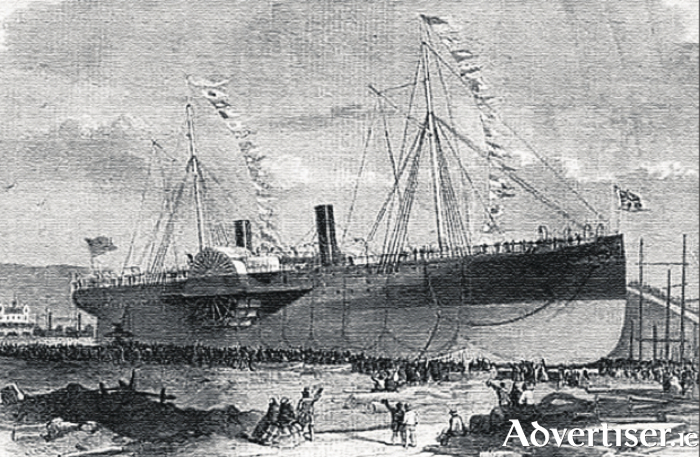 As I mentioned last week during its six years of the difficult and challenging business ferrying passengers, mail, and cargo from Galway to New York and Boston, out of a fleet of 16 ships, six were involved in serious accidents due to ice and fog as well as storms; while five made only one trip or foundered on their first crossing. However between 1858 and 1864, a total of 55 return voyages were successful. These gallant ships were driven by a mixture of paddle-power and sail, or the more advanced screw-power. These technologies were not fully tested before they were launched in ships full of passengers who, no doubt, put their trust both in God and the weather, rather than the engineers. Except for its miraculous saving of all lives on board, the sinking of the PS Connaught reflected the misfortunes of the Titanic, half a century later. Built by the Palmers Shipbuilding and Iron Company in Newcastle upon Tyne, 380-feet long iron hull, was driven by a single steam engine which drove two side-paddle wheels. It was among the giants of the sea in its time, and probably its most opulent. In the state rooms the panels are painted white; while ‘the moulding is entirely burnished gold’. Away aft, there is a row of loungers in crimson velvet’. There was more maple, walnut and plate glass. On Tuesday September 25 the PS Connaught sailed for Boston with 462 passengers, and a full cargo on board. She arrived on schedule after a trouble-free voyage. While in Boston some 10,000 people visited the ship, and no doubt exclaimed at its magnificence and comfort. On Saturday October 6, the PS Connaught steamed out of Boston on her return voyage with 591 passengers and crew on board. That evening, about 160km northwest of Boston, a leak was reported in the main engine room. The ship’s pumps were unable to keep the water from rising. In the early hours of Sunday morning, the water had put out the the main engine furnaces. The auxiliary furnaces were lit, but they quickly caught fire and were soon out of control. As the fire spread the passengers were driven onto the deck where they spent a distressing night watching the fire spread forward through the ship. But just when most of the poor people contemplated death either by fire or drowning, a small fruit-merchant ship, the Minnie Schiffer, appeared out of the mist and, miraculously, came alongside the sinking ship. Within minutes all the passengers and crew crowded on to the brig, captained by John Wilson. So many people boarded the tiny transport that they stood on every available patch of deck. Some were forced to cling to the masts and rigging. Captain Leitch was the last to step off the burning ship. Having cast off lines, the Connaught was set adrift and, was last seen, one mass of flame. The Minnie Schiffer returned to Boston. Of course the Galway Vindicator once again smelt a rat. As with the case of the Indian Empire two years earlier, foul play was mentioned. Rumours of sabotage of the boilers and ship pumps was hinted at. Again nothing was ever proved. Whatever the reason for the sinking of the Connaught, it was another serious blow for the Galway Line. Next week: The New York Times picks up the story of the gallant Captain John Wilson. NOTES: *Incredibly this state of affairs was to continue until the sinking of the RMS Titanic brought the matter to the attention of a horrified public 52 years later. This week I am leaning heavily on Tim Collins’s magnificent Transatlantic Triumph and Heroic Failure - The Galway Line, published by The Collins Press, 2002.